This dessert is one of the easiest I've made. However, it's very deceiving! It looks elegant and like it took hours to layer. People rave about this one and they'll only know it's dressed up ice cream sandwiches if you tell them! It is very yummy and perfect for summer! Cut one sandwich in half. Place one whole and one half sandwich along the short side of an ungreased 13x9 dish. Arrange eight sandwiches in opposite direction. Spread half of the Cool Whip over sandwich layer. Spoon fudge over Cool Whip and top with 1/2 cup peanuts. 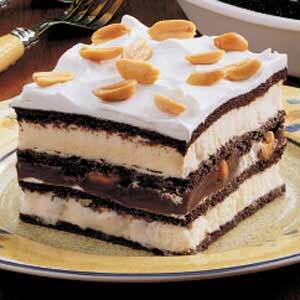 Repeat layers with remaining sandwiches, Cool Whip and peanuts. The pan will be full. Cover and freeze up to 2 months. Remove from freezer about 20 minutes before serving. Cut into squares.